I've noticed that I've become more emotional after becoming a mom. I've also began to see life from a larger perspective. The little things roll off my back more easily. I have become loads more efficient in some ways, while extremely less efficient in others. I have had to surrender the need to check everything off a to-do list (still a lesson!). And I've become aware of how I want to live my life as a role model to my son. So I asked myself, "What would I want for my son to know? What do I want for him to understand about the world?" I finally put down 7 life philosophies onto paper that I want for my son and wish for you, too. Now, as a coach and lifestyle expert, I've helped countless people all over the world create more self-love, happiness and calm through my simple 6-step method. 1. Life is filled with magic. I'm a believer in magic. The kind of magic that every child knows and yet most adults forget. That there is wonderment and mystery to be found everywhere if you keep your eyes open. Signs point you in the direction your heart knows to go. Coincidences connect you to people and places you couldn't have imagined. There is support for you, always, when you ask. 2. You will make mistakes, but you are always deserving of love. Brene Brown said this beautifully during her Ted Talk on vulnerability. That our job as parents isn't to keep our children perfect by ensuring they make the soccer team and get all straight A's and never mess up. That our job as parents is to let our children know that they will make mistakes, they will feel vulnerable at times, but they are always deserving of love. And so are you. What a beautiful world it would be if every child grows up understanding that. Recently I spent a weekend with some of my best friends at a wedding. I laughed so hard for three days that I felt like an entirely different person upon returning home. It's amazing how much lighter we feel from a good belly laugh. Dr. Madan Kataria founded an entire yoga devoted to laughing for no reason! It comes from the deep seated belief that laughter is healing on an emotional, physical and spiritual level. So let yourself laugh freely. 4. You are probably not a victim. There are real victims in this world. People who have no voice and no choice. Realize that most likely you are not one of them, no matter what difficult situation you may encounter. Be the hero of your story. The hero that seeks challenges, makes mistakes, but gets back up again because he always has guidance and choice available. Don't play into the victim role. It is powerful, but doesn't feel good. 5. Respect nature, and all living things. To me, this isn't philosophical or religious, it just makes common sense. The world is made up of amazing living things...expressions of all of life. And we are all interconnected. So respect the people around you, yourself, be kind to animals, show gratitude to Mother Nature. Heck, even respect non-living things! Clean up after yourself. Take care of your car. Show your gratitude by caring for all that you have. 6. It is okay to rest. Our lives are speeding up. We are pushed to do more, see more, buy more, and be more. And seldom do we let ourselves rest, even if we're exhausted. Sometimes, we may not even realize just how exhausted we are until we sit still for a minute. There are many reasons for this. It could be guilt that there is something more productive you should be doing. Or it could be fear...afraid of the thoughts or feelings that come up if you stop being busy. But know that it is all good, and that allowing yourself to rest will only lead to more joy and health in your life. 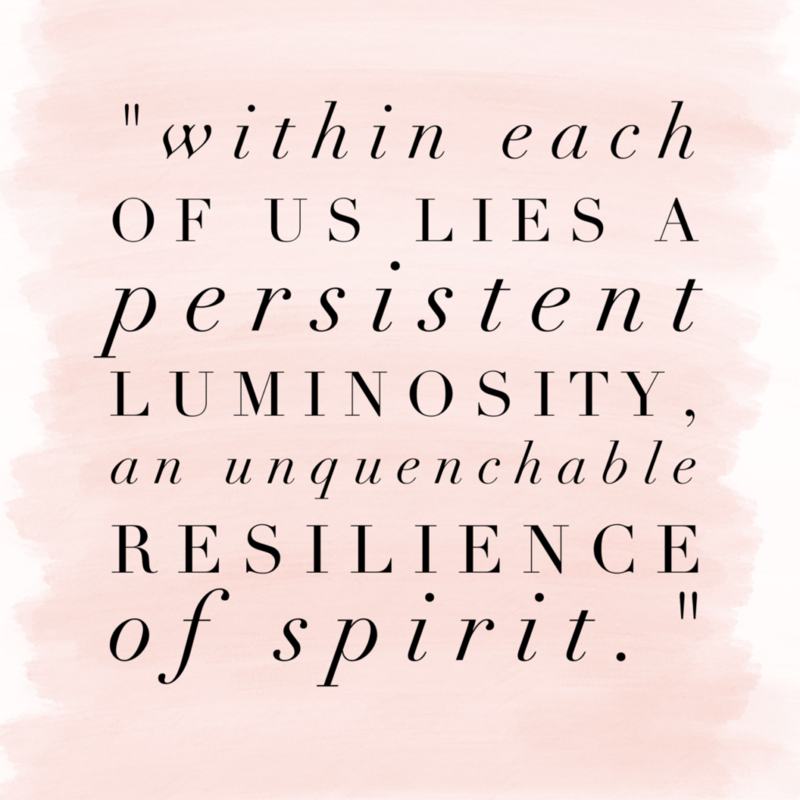 I believe that there lies within us what can be called persistent luminosity, an unquenchable resilience of spirit. Whatever you go through in this life, remember that strength within yourself even if it's hard to find. 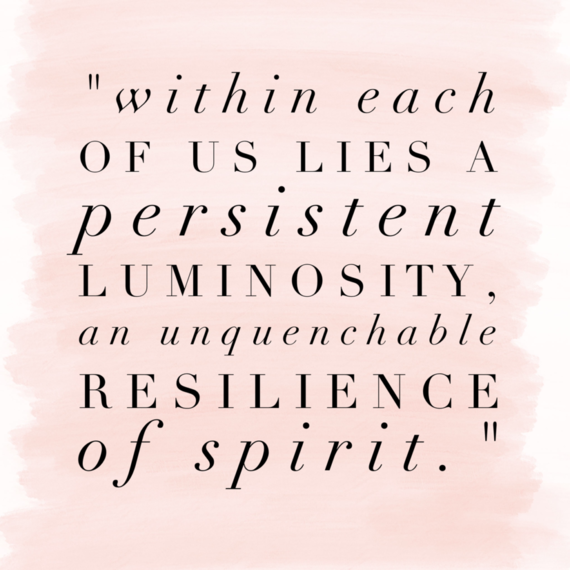 Cling to that luminosity of spirit that resides within - the flickering candle in the dark. You are strong, and even when you feel weak, you always have me. For more inspiration, get my 6-step guide to feeling more self-love, happiness and calm.